At an early age Naminapu watched her father Nanyin paint and when she was about about 12 tears old, and was also taught by her uncle Narritjin Maymuru. Both men were extremely capable and well-known artists, and their works hang in many Australian and overseas museums. As one of the first Yolngu women to be taught to paint miny'tji (sacred creation clan designs) Nami assisted with the historic paintings by the elders in their Land Rights struggle, with the the Bark Petition and the Yirrkala Church Panels. 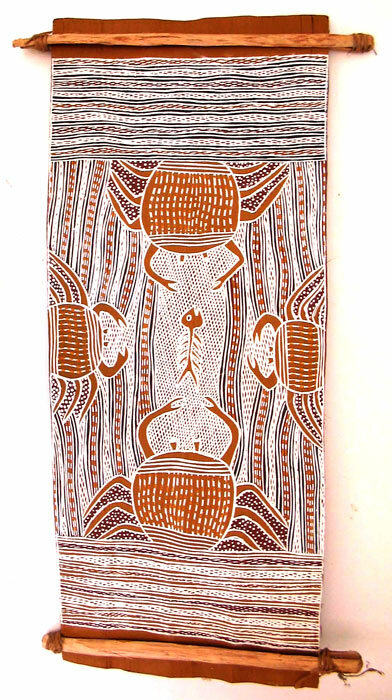 1998 Buku-Larrgay Mulka, Print Exhibition, Yirrkala N.T.